For transfers from the airport or the port or tours around the island there is no better way to see Crete than to go with Lefteris Nikiforakis in his luxury Mercedes taxi and his brand new Mercedes bus and mini-bus for larger groups. Crete is a big island and Iraklion is a rather large city for an island. Many people look at it and wonder to themselves "Where do I begin and how will I see all there is to see?" This is where I come in. My name is Lefteris Nikiforakis and my friends from abroad call me 'Lefty' because they say Lefteris is hard to pronounce. Its not that hard really. Leff-Tair-iss. But I like the nickname. It makes me sound like a pitcher on an American baseball team. You can call me whatever you like but I hope when you finish one of my tours you will call me your friend. I have two tours that are designed for people arriving on the cruise ships who have limited time and want to make the most of it. But I can also do custom designed tours and transfers too. I speak fluent English and German and I know about history and the Greek culture and when you leave my island you will be surprised at how much you have seen and have learned no matter how short your visit. 1.Venetian port (1200 years old). 3.Cathedral (biggest in Crete,105 years old). 7.Knossos palace (4000 years old). 3.Visit to small traditional villages. Plus of there are other places you want to visit I can take you there too. If you are of Greek heritage looking to find lost relatives in your ancestral village I can take you there and help you fond them and translate if you speak little or no Greek. 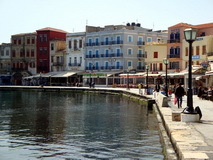 With cruise ships now coming to the beautiful town of Chania I am now doing tours from here. The ships usually stay from 7 to 9 hours so I offer a tour from 5 to 6 hours which starts around 08:00am at the boat. Our first stop is to the grave of the Venizelos family where Greece's greatest Prime Minister is buried and there is a panoramic view of the town of Chania. After that we drive to the old town of Chania where our next first stop is in the old central market building which is still being used today. Then we visit the historic Venetian port and see the blue mask, the old Venetian light house, the leather street, and the knife street. After Chania we drive to Aptera. From Aptera through small country roads we visit the villages of Stilos, New Xorio, Brises, Georgioupoli, then we arrive to Rethimnon and back. In this tour we see the lifestyle of local Cretan people and the lovely country side. 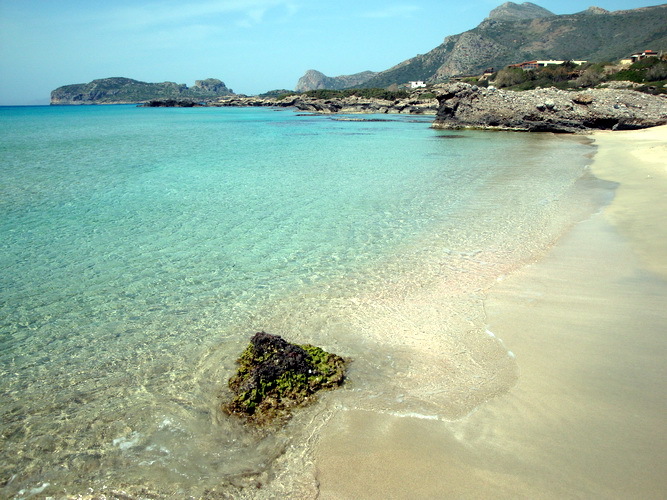 If there is somewhere special (like some of the monasteries or the beach) you want to visit we can go there too. You can contact me for the tour prices. I also do transfers from the ferries, and airport to hotels or anywhere you would like to go in Crete whether you are starting in Iraklion, Chania, Ag Nikolaos, or Rethymnon. I can take you to the entrance of the Samarian Gorge and meet you later at Paliohora or Hora Sfakion and bring you back to your hotel. I can take you to distant beaches and to tavernas that very few tourists ever go to and I can translate and tell you all about the Cretan diet and customs. I guarantee that a trip with me will be a greater adventure than driving around on a bus with 40 other tourists or struggling with the public bus system. Plus if you find other people to share the cost then I am cheaper than the big tours and much more flexible. 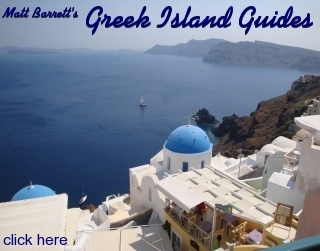 I am recommended by Matt Barrett's Greece Travel Guides and I am also recommended by George the Famous Taxi Driver of Athens, the Godfather of pre-arranged taxi tours. And maybe by the time your tour ends I will have taught you how to say my last name: Nikiforakis (Nicky-four-ak-iss). By the way you can click on these photos if you would like to see them larger. Some will inspire you to come to visit our island. I look foreword to hearing from you. Thank you again for a wonderful tour of Crete. May 20th, not sure if you will remember but you asked for copies of pictures and I am attaching them to this email. It was a wonderful trip and we were extremely pleased with the informative tour you provided. The lunch the sweet lady provided was the best lunch we had on our 18 day journey. I would like to thank you again for the prompt & courteous service we received from you during our stay in Crete. Our airport transfers were on time and our day touring with you was enjoyable & informative. Thanks for being our guide in Crete, and arranging for Jiannis to meet us in Chania. We all felt you did a great job, and we appreciated your services. Your knowledge of the island, selection of where to go, and attention to detail were all very helpful. If someone asks you for a reference, I'd be pleased to respond (positively). I wanted to send you a note to let you know how much we enjoyed spending the day with you on January 2. Leesa, Rebecca, and I consider our day on Crete with you to be the highlight of our trip! We loved to see the countryside of Crete - the olive trees, orange trees, vineyards, and farm land. Our lunch at your friend's restaurant on the mountain top was also very nice. It is the small things that make a trip such as this one special - like stopping for coffee at the cafe in the little village where the old guys were talking about their farming. I am sending a few pictures for you to enjoy. Thanks again for such a great visit on Crete. I will recommend your services to others who decide to visit your beautiful island! We finally arrived home last night. As our luck would have it we were caught up in the air traffic controller strike in Athens and had to delay our departure. 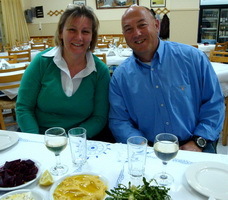 I wanted to thank you for showing us around Crete. Our day with you was one of the highlights of our trip. We kept our sense of humor when things went wrong and managed to have a good time. I still haven't found where I saw your name in print and if and when I do I will surely let you know. I wanted to thank you for providing a link to the most amazing taxi driver/tour guide in Crete...Lefteris. Four of us spent a day touring Crete with Lefteris, and I know I speak for everyone when I say that it was the most memorable day of our 2-week Mediterranean cruise. 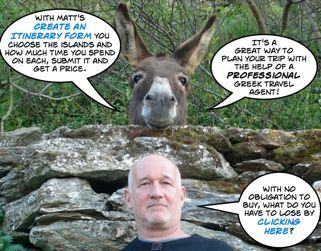 He's knowledgeable, friendly, articulate, and generously shares the Crete he loves (not what most tourists see). I highly recommend "Lefty" to anyone visiting Crete. And this one to Matt Barrett! I have used your website for guidance since 2001. Always found it helpful, informative, honest and you always reply when I�ve had a question. This past September, it was our third trip to Greece, we visited Crete again as I have family there and it is one of our favorite islands. This time, we hired Lefteris��twice in one week! Just want to say this was the best thing we could have done. We are only sorry we didn�t do it during our previous visits. I sent him a note as well, as I promised I would, and hopefully, he will post on his website the glowing, yet honest, review we have given him. Just wanted to let you know too that we took this recommendation from your website and it was perfect! Thanks again for such a great resource for people traveling to Greece. Do you enjoy using my site? Have you found it entertaining as well as useful? If so please show your appreciation by booking hotels through the travel agencies and the links found on my Crete Hotels page. The small comission I make on the bookings enable me to keep working and in most cases you won't find them any cheaper by searching elsewhere. You can find hotels, apartments, rooms and even houses through Booking.com's Crete Pages which also contributes to my website when you book.